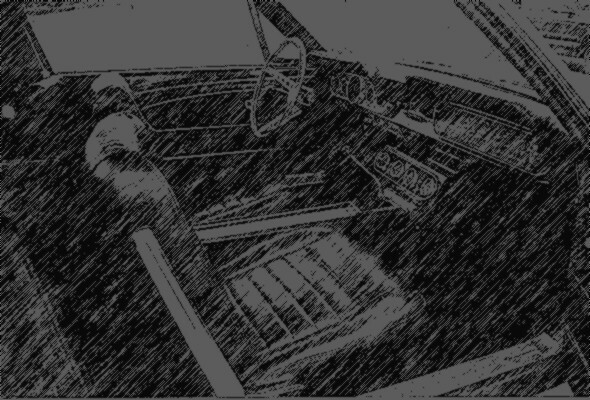 The doors were opened up and inspected although funds preclude restoration at this time. So... they will stay black along with black door panels. When restoration does occur, the doors will be stripped and removed (the LH door, at least) from the car for some rust repair before repainting. I did confirm that the RH door is original to the car while the LH door is from another vehicle that had what looks like a '65 red interior. Fortunately, the door data plate was transferred to the replacement door. 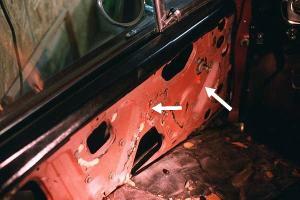 Looking at the LH door with the door panel removed and the watershield pulled down. The interior surface behind the panel was covered with a red oxide colored primer and the black paint lines were very evident. Hard to see, the white arrows point to areas where old sealer was pulled off exposing this door's original bright red interior paint. This door also has the worst exterior rust and will be stripped, removed, and sent to a local body shop for rust repair before the interior side is repainted to parchment. This RH door is original to the car. It has the original vintage burgundy basecoat sprayed over it from when the doors were hung and the body painted at the assembly plant. The blue arrows point to areas of overspray where the interior surface was painted parchment. 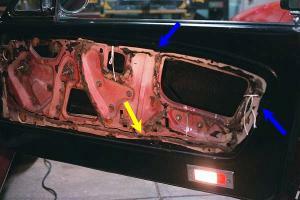 The blue arrow points to one example of the jagged masking line where black was sprayed. The clips used to secure the courtesy light wiring harness inside the door were missing on both doors so I used string to hold the harness out of the way while I coated the inside door shell bottom with POR15. This page will be updated when the doors are finally restored.